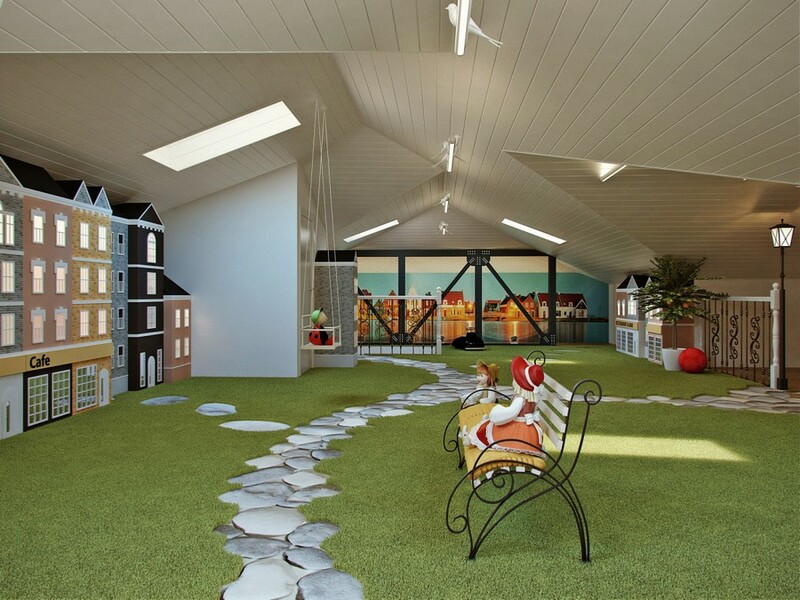 How to design a game room so that it was equally interesting for a school boy and his small sister? 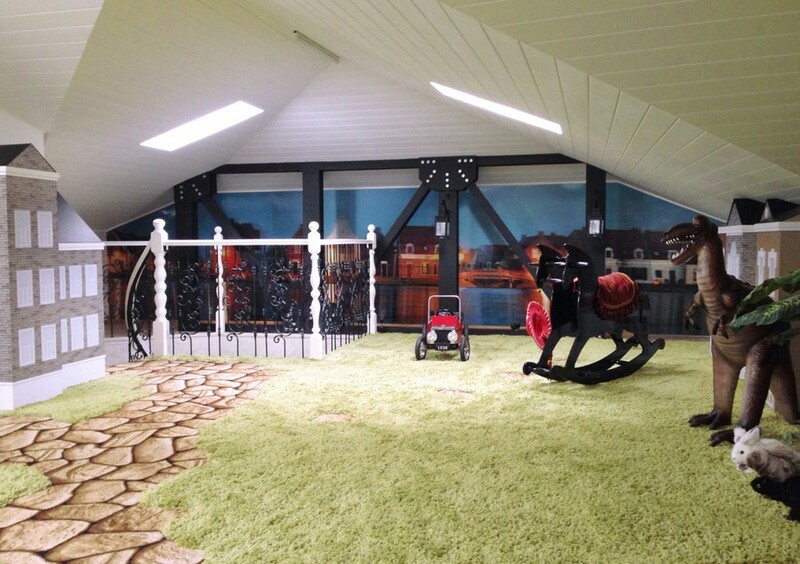 Today we’d like to tell you a story of a stunning play zone arranged in the old attic. Imagine a little European town with a park, where kids can walk and play. Paved paths, neat lawn, fruit trees and a lake on the other side… All of these fantasies came true in this room. 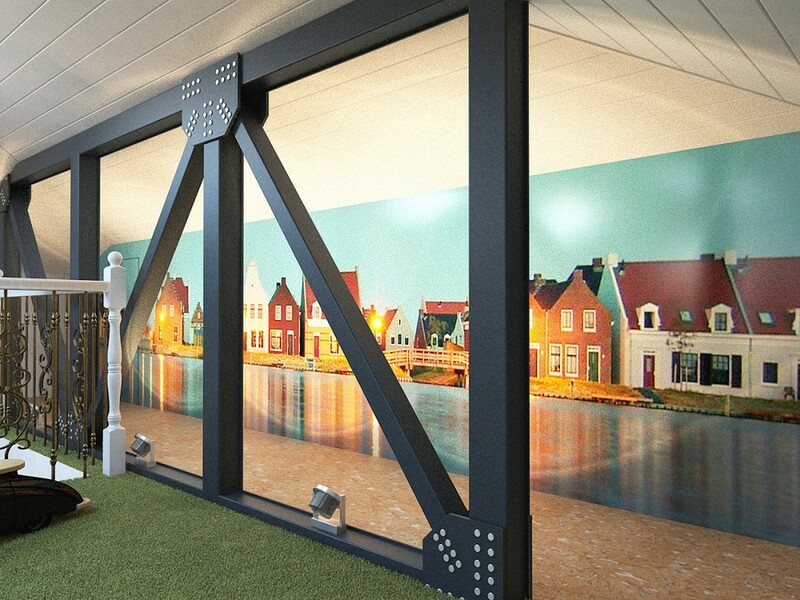 To make the lake wall mural seem three-dimensional and animated it was printed in the stereo vario format: with this technology the image is first printed on paper and then on a big plastic lens. Afterwards the “park” was complemented by a lawn, garden paths, a bench and a swing. And the little girl got a house with a lounge and a kitchen. Significant variations of sloped ceiling height to a great extent pre-determined the room layout. The central part was preserved as open as possible, while the parts where the ceiling height decreases down to 1.2-1.3 meters were organized as little houses. This make the ceiling seem higher in this part of the room. And even a small bathroom could be envisaged near the stairs. 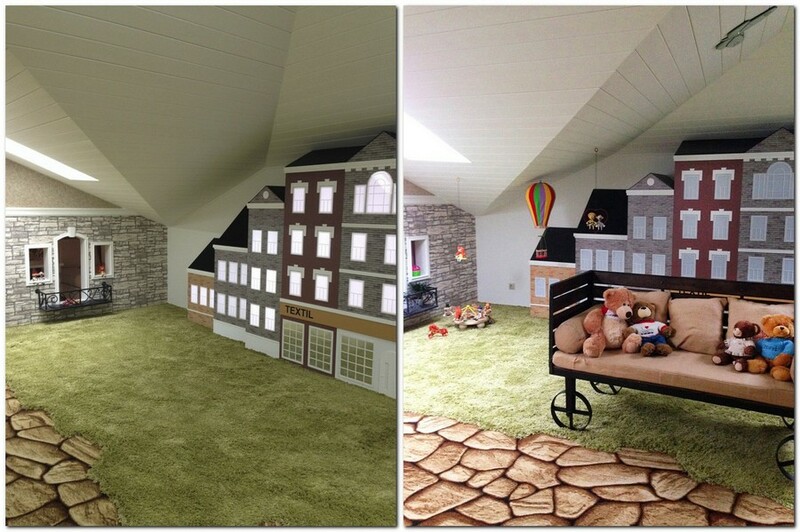 Since toys are usually very bright and become color accents of kid’s room per se, it was decided to make the background not too motley: green, gray and beige. And some contrast and graphics is added by the black bridge and roofs of the houses. All the houses were custom-made on a furniture mill. And elements of upholstery and décor were ordered from a company producing advertising structures. The floor is covered with shaggy green carpet imitating the grass. And low pile carpeting was glued in the place of the paved garden paths. The house is designed in such a way that the staircase leading to the attic is located next to the kids’ bedroom, so the small inhabitants of the game room and their guests can come here without disturbing the adults. And one more plus of this room is that kids can leave their toys as they are – there’s no need to keep them in boxes and cabinets as in customary toddler rooms.